Zinc chloride has the importance in pharmaceutical/nutraceutical industries for the prevention and treatment of several diseases. The objective of the current study was to investigate the impact of The Trivedi Effect®-Energy of Consciousness Healing Treatment (Biofield Energy Healing Treatment) on physical, structural, and thermal properties of zinc chloride using PXRD, PSD, FT-IR, UV-vis, TGA, and DSC analysis. Zinc chloride was divided into two parts. One part was denoted as the control without any, while the other part was defined as the Trivedi Effect® Treated sample, which received the Trivedi Effect® Treatment remotely from eighteen renowned Biofield Energy Healers. The PXRD analysis revealed that the crystallite size and relative intensities of the PXRD peaks significantly altered in the treated sample compared with the control sample. The crystallite size of treated sample was decreased by 4.19% compared with the control sample. The particle size at d10 and d50 of the Biofield Energy Treated sample decreased by 4.72% and 2.70%, respectively compared with the control sample. But, the particle size of the treated sample increased at d90 by 0.83 compared with the control sample. Consequently, the surface area was increased by 3.22% in the treated sample compared with the control sample. The FT-IR spectroscopic analysis revealed that Zn-Cl stretching in the control and treated sample was at 520 cm-1 and 521 cm-1, respectively. The UV-vis analysis exhibited that the wavelength of the maximum absorbance of the control and treated samples was at 196.4 and 196.2 nm, respectively. The TGA thermograms revealed two steps of the thermal degradation and the weight loss of the treated sample was significantly reduced by 22.54% in the 1st step of degradation compared with the control sample. The DSC analysis showed that the enthalpy of decomposition was significantly increased by 34.9% in the treated sample (89.17 J/g) compared with the control sample (66.10 J/g). Overall, DSC and TGA analysis indicated that the thermal stability of the treated sample was increased compared with the control sample. 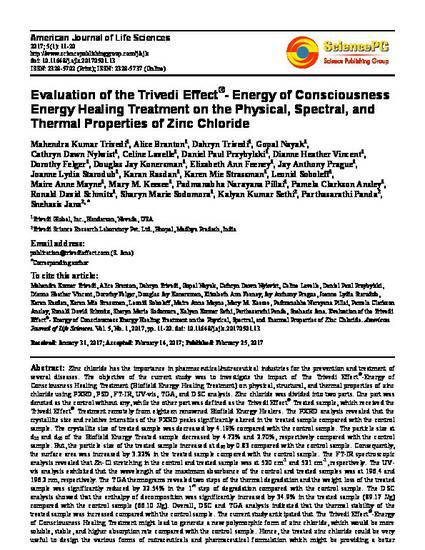 The current study anticipated that The Trivedi Effect®-Energy of Consciousness Healing Treatment might lead to generate a new polymorphic form of zinc chloride, which would be more soluble, stable, and higher absorption rate compared with the control sample. Hence, the treated zinc chloride could be very useful to design the various forms of nutraceuticals and pharmaceutical formulation which might be providing a better therapeutic response against inflammatory diseases, immunological disorders, aging, stress, cancer, etc.